Water is vital for life. But as our climate changes, the availability of water is also changing, leaving animals with limited or unreliable supplies of this critical resource. 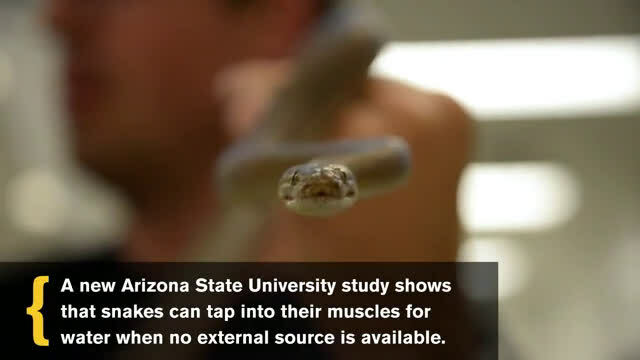 However, a new Arizona State University study published in the Royal Society journal Proceedings of the Royal Society B: Biological Sciences shows for the first time that animals may be able to use their own muscles to get water when it's not available. Researchers from ASU and the Centre d'Etudes Biologiques de Chizé in France teamed up on the project and the findings were published June 27. "We know about the importance of fat reserves to fuel the energetic costs of reproduction. But what about water? Our study shows that during reproduction, muscle metabolism is linked to the water requirements of developing offspring. Fat is only about 10 percent water, whereas muscle is closer to 75 percent, so burning muscle will release extra water," said George Brusch IV, lead investigator for the project and doctoral student at Arizona State University. "From an evolutionary perspective, the concept of capital breeding—or using stored resources to fuel reproduction—is currently restricted to energetic needs. We propose that this should extend to a broader, multi-resource strategy that also includes water allocation." The researchers looked into this concept by studying the effects of water deprivation on the reproductive efforts of female Children's pythons, a medium-sized snake that reproduces during the dry-season in Australia, where natural water sources are extremely limited. They found that muscles play an important role in providing water to the body when none is available. "Female Children's pythons can change how they use internal resources based on limitations in the environment," said Brusch. "Understanding exactly how animals cope with resource restrictions will help scientists predict whether the animals might be impacted by future climate change, where, in many regions, rain is expected to be less reliable," said Brusch, a doctoral candidate in the School of Life Sciences biology Ph.D. program. 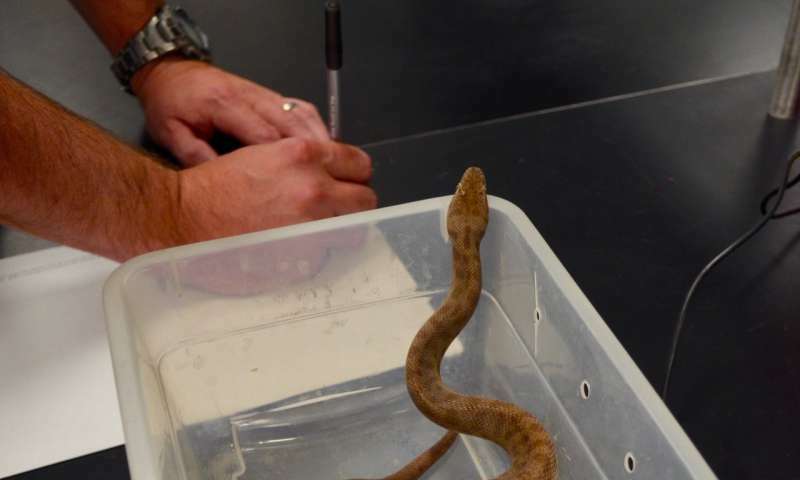 The scientists then measured the by-products of burning fat and muscle such as ketones and uric acid, as well as muscle size and impact on the snakes' eggs and clutch sizes. The animals without water burned more muscle than fat to meet their water requirements. In addition, the animals without water laid a similar number of eggs per clutch, but their eggs weighed less and the shells were thinner. Brittany Kaminsky, an ASU student researcher on the team, just graduated from the School of Life Sciences with a Bachelor of Science degree in neurobiology, physiology and behavior. Kaminsky, who will attend U.C. Davis School of Veterinary Medicine in the fall, coordinated much of the project. "I think what was most interesting about our results is that dehydration can play complex roles in reproduction, such that it affects other body systems. 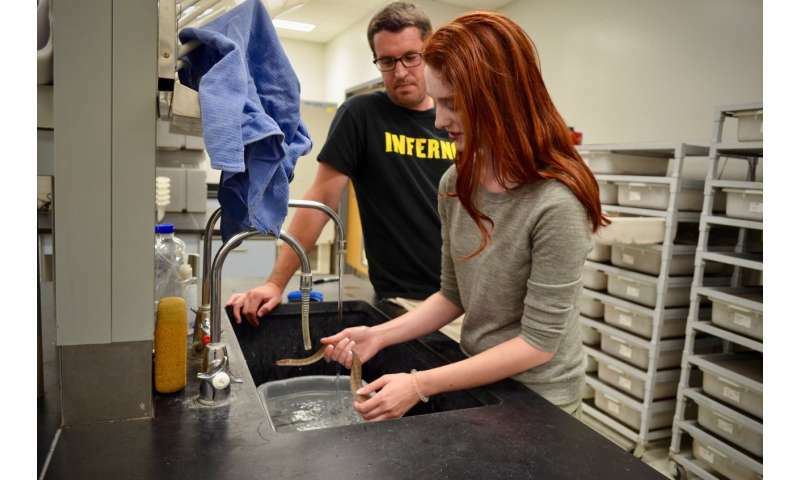 I feel, at the organism level, a single ailment can manifest in a variety of ways, and I think this is valuable information that I will carry with me into my veterinary career," said Kaminsky. During the project, Kaminsky helped pair the females into the reproductive and non-reproductive groups by mass and snout-vent length. She also monitored the reproductive progress of the females by ultrasound and learned how to collect blood samples, process and store them. "Few of my peers have had the opportunity to train a team of other undergraduates or learn some of the technical skills I developed throughout the course of the study, such as cardiocentesis and ultrasound," said Kaminsky. "Dr. Dale DeNardo and George were both there when I needed guidance, but they also gave me a lot of space to learn on my own and grow as a scientist. I couldn't have asked for better mentors." Most animals need steady access to water in order to survive, especially during reproduction, and the authors suggest that using muscle as a water store may be a widespread phenomenon. "Our enhanced knowledge regarding the relationship between hydration and reproductive investment will also enable us to better understand global responses to water limitations and change the way scientists approach reproductive investment in ecological contexts, which, in the past, frequently ignore water and focus solely on energetic resources," said Brusch. Orsini's viper: Growth or reproduction? They get it from Food. Not from cup of glass. Tiny Animals !